We're always in need of a handy little cross body for getting around town and on day trips. 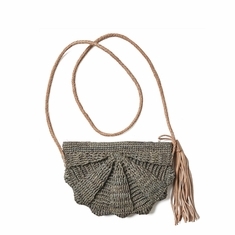 This one fits the bill with sea inspired scalloping and a flirty leather tassel. Crocheted raffia crossbody with cotton lining, leather strap & tassel and zip closure. 6.5"h x 9.5"w with a 24" strap drop. - Approximate dimensions, each piece is handmade.